Ten years after Hurricane Katrina, the aftermath of the storm remains visceral to even the distant observer. Few people outside Louisiana, however, realize that the city’s future depends in large part on what happens some 80 miles to the southeast, where the Mississippi River meets the sea. Along this river, decades of infrastructure have crippled the Delta’s natural regenerative, land-building systems, withering its wetlands. With these protective lands diminished, Katrina’s surge rolled unstopped into the heart of New Orleans. The alarming pace of the Delta’s decline is now a familiar refrain of statistics: nearly 1,900 square miles of coastal wetlands – an area the size of Delaware – have vanished in the last hundred years, and every hour, a football field-size area of land is lost. By 2100, projections tell us, virtually all of these wetlands will be gone, unless something is done. Today, the Lower Mississippi River Delta is at a turning point, one that demands nothing less than an eventual rerouting of the river, but also new thinking that points to the future of large-scale environmental management and solutions for addressing climate change on a regional level. Such remarkably complex challenges require a process that develops multiple approaches, disciplines and a toolkit of solutions to guide the region’s future. In 2013, the international environmental nonprofit Environmental Defense Fund, 120-year-old design competition organizer, Van Alen Institute, and multidisciplinary consulting engineering firm, BuroHappold Engineering, launched the international design competition Changing Course, bringing together some of the world’s leading engineers, coastal scientists, planners, and designers to tackle a crucial question raised by the state of Louisiana’s master planning process: how to restore and maximize the Mississippi River’s land-building capacities while maintaining a world-class navigation system and supporting and respecting the communities, industries and peoples of the coast. Last week, Changing Course’s Leadership team announced the three winning teams, sharing the far-reaching solutions they’ve developed. With deltaic lands subsiding worldwide, and coastal cities from New York to Mumbai and Shanghai facing increasingly violent storms and rising seas, the teams’ proposals contribute to a global effort to restore and protect coastal ecologies, communities and economies. The winning multidisciplinary teams, led by Baird & Associates, Moffatt & Nichol, and Studio Misi-Ziibi, arrived at distinct approaches to the competition brief. Some of their proposals will become the subject of intensive technical evaluation and development while others point the way for preparing communities and industries for long-term change. 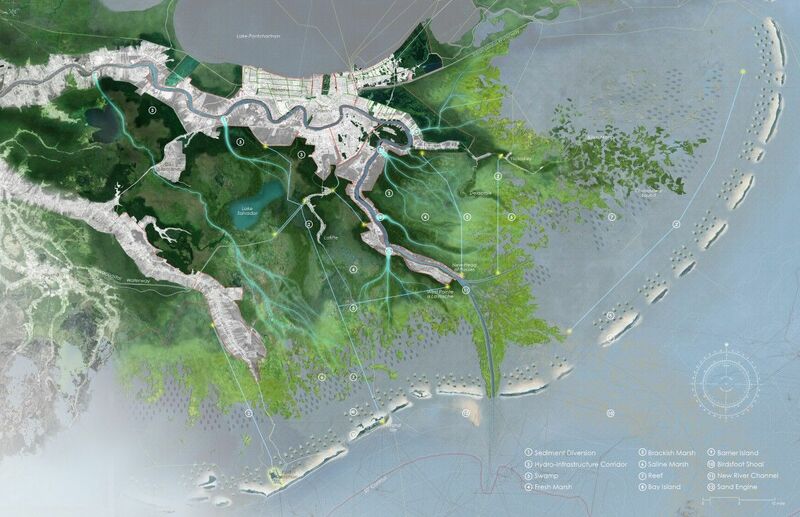 •	The teams concluded that New Orleans and the Mississippi River Delta are sustainable, but not in their current form. There’s not enough sediment to help restore the entire delta footprint, and rising sea levels will only put more pressure on already dying wetlands. To plan for a smaller more resilient Delta, we must prioritize restoration projects in a more focused area, and help affected communities and industries adapt over time. 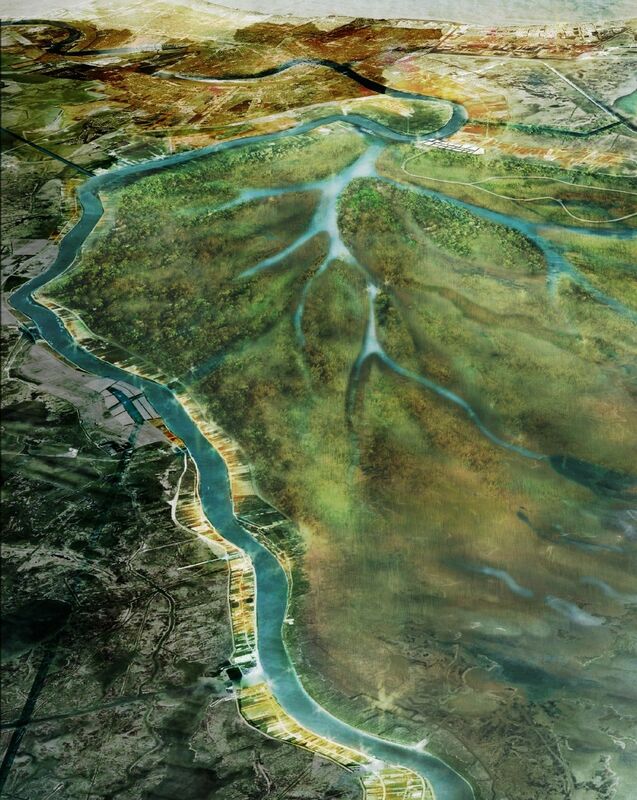 •	Instead of confining the river in a way that ensures that valuable sediment is lost to the Gulf of Mexico, the teams developed strategies to work with its natural cycles, allowing it to periodically distribute sediment to surrounding wetlands, restoring ecological function, rebuilding land and habitat, and ultimately, helping to protect the region from future storms. •	Sediment is the lifeblood of coastal wetlands but an impediment to navigation. While wetlands need sediment to survive, Louisiana’s ports and the many industries that depend on the Mississippi for shipping constantly need to remove sediment to clear and deepen navigation channels – especially for the new generation of post-Panamax vessels, as tall as 5-story buildings. To balance these priorities, the teams proposed different concepts of a shorter river that deposits sediment in a sustainable delta footprint. All designs maintain a constant and dependable shipping channel and harness the natural forces of the river for sediment distribution. 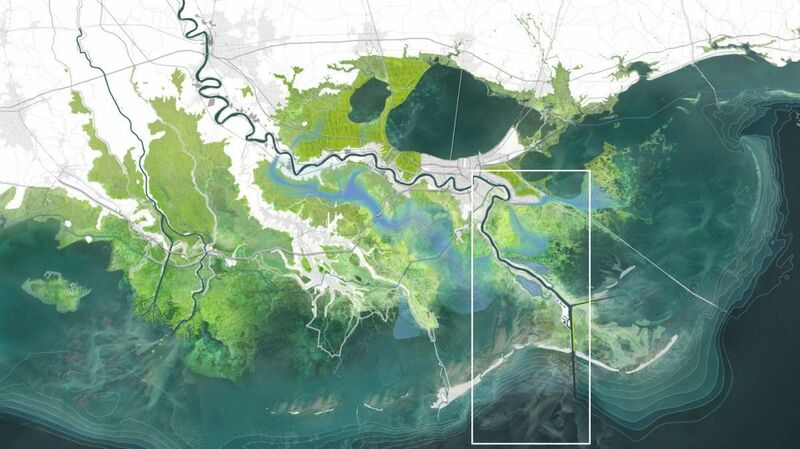 By removing sediment from the river channel to nourish coastal ecologies and build natural storm barriers, the teams produced win-wins for coastal stakeholders. Changing Course was structured as a global multidisciplinary effort to foster innovative, yet actionable visions for the Delta’s future management, to build upon existing knowledge and expand the art of the possible. Though the State Coastal Master Plan already in place served as a guideline for the proposals, teams were encouraged to look over a longer time horizon and bring bolder solutions. Results from the competition have been well received: the State of Louisiana plans to incorporate concepts generated by Changing Course as it analyzes alternatives to the current management of the lower Mississippi River in an $8.2 million project funded through the RESTORE Council. In addition, the State of Louisiana will receive billions of dollars over the next 15 years to be prioritized for coastal restoration projects, from sources such as the BP the Deepwater Horizon oil spill and the Gulf of Mexico Energy Security Act. In Louisiana and other coastal regions, meaningful responses must incorporate the knowledge of leading experts as well as the views of affected communities and local expertise. As a complement to Louisiana’s forward-looking coastal restoration plans and initiatives, Changing Course has helped to galvanize expertise and catalyze innovative thinking. Understanding the full impact of Changing Course will take years – but in light of the substantive outcomes, the competition offers a model for driving the level of innovation needed to address climate change and sea level rise in other coastal settings. Changing Course is supported by the Rockefeller Foundation, Shell, Greater New Orleans Foundation, Blue Moon Fund, the Kresge Foundation and the Walton Family Foundation. Kate Ascher leads BuroHappold’s Cities Group, which specializes in urban planning and development. David van der Leer is an urban thinker and activator, and the executive director of Van Alen Institute in New York City.